An evening was held in celebration of acclaimed author Agop J. Hacikyan’s literary career on Friday, October 29, in New York City. 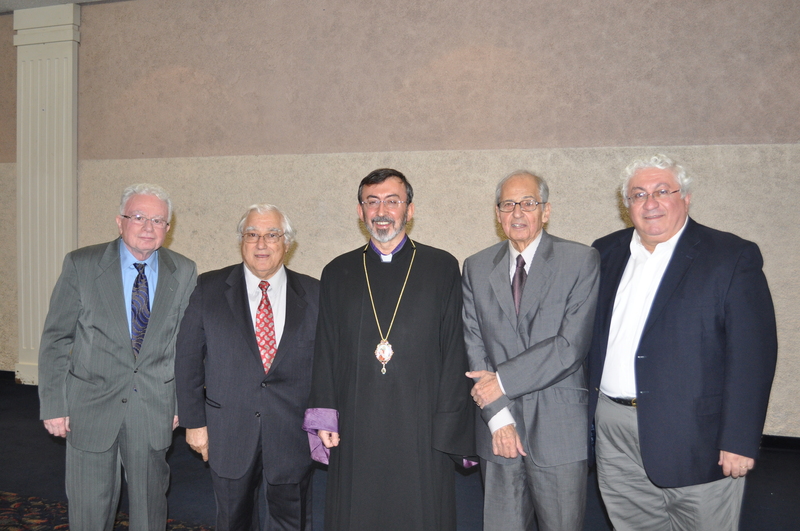 The event was held at the Diocese of the Armenian Church of America (Eastern) under the auspices of the Primate, Archbishop Khajag Barsamian. A sizeable audience gathered in Haik and Alice Kavookjian Auditorium to honor the Canadian-Armenian author whose epic novel, A Summer Without Dawn, has been lauded widely by both the Armenian and international press. Mr. Hacikyan, the author of some two dozen books—including the monumental three-volume Heritage of Armenian Literature, and his most recent work, The Lamppost Diary—stressed the importance of the novel as a tool to teach about historical events—especially those that might otherwise escape wide notice. The novel’s potential to reaches a wider audience makes it a powerful genre to teach about genocide, Hacikyan said. “It is essential to produce genocide fiction, as long as we don’t fictionalize genocide,” he urged. When writing the international bestseller A Summer Without Dawn—an historical novel set between 1915 and the early 1920s—Hacikyan strove to write a powerful yet captivating story that would keep readers in suspense. His reading, family stories, and imagination contributed to the final work, which has been described by reviewers as an Armenian epic on the scale of Doctor Zhivago and Gone with the Wind. The novel, which moves from Anatolia and the Middle East to Europe and America, was first published in Quebec, where it made the bestseller lists. German and Spanish translations soon followed; a Turkish translation, which was well-received, is currently in its third printing. Since its original publication in French in 1991, it has been translated into eight languages. Archbishop Barsamian, in concluding remarks, said it was significant to honor Agop Hacikyan in October, when Armenians observe Armenian Cultural Month. Introducing the guest of honor were three distinguished literary figures of the Armenian community, each of whom provided their insights into the author’s life and works. Delivering remarks in Armenian, Hagop Vartivarian, an active member of the Tekeyan Cultural Association and a contributor to the Armenian press, spoke of Summer Without Dawn’s impact on supporting the Armenian cause. Osheen Keshishian, founding editor and publisher of California’s Armenian Observer newspaper, spoke in English about Hacikyan’s literary career. He traced his youthful beginnings as a poet, and spoke about Hacikyan’s foray into prose, which ultimately led to the writing of A Summer Without Dawn in 1991, and his subsequent novels. Berc Araz, the evening’s master of ceremonies, spoke of Hacikyan’s immense contributions to genocide literature, and to the broader literary community. Noting that Hacikyan’s work has made bestseller lists in Canada and abroad, he urged members of the Armenian American community to continue supporting such endeavors by reading and spreading the word about Hacikyan’s oeuvre. A book signing and reception followed the presentation. This event was organized and co-sponsored by the Krikor and Clara Zohrab Information Center of the Diocese of the Armenian Church of America (Eastern), Tekeyan Cultural Association, Constantinople Armenian Relief Society, Tibrevank Alumni, Esayan-Getronagan Alumni, Armenian Cultural Center of Forest Hills, and the Armenian-American Support and Educational Center. Agop Hacikyan’s books are also available from the St. Vartan Cathedral Bookstore, 630 Second Avenue, in New York City, or on the web at www.stvartanbookstore.com.